Do I enter as a runner or walker? If you are thinking of jogging or running AT ANY POINT in the event you do need to be entered in the run category. The walking category is only for those who have committed to walk the event from start to finish. Please ensure you are entered in the right category at pre race registration. Will the walk event be policed? No. We will do our best to ensure all participants enter the correct category (run or walk) at pre race registration but that is where our policing stops. No event staff will be policing that each walk category participant will be strictly walking across the entire event course on the day as this is not an official sanctioned walk event. Walkers in the Half Marathon and 10km have their own start time separate to the runners and we wish all the walkers the very best out there on a beautiful course! Where does the race start from? The start line for all events is on the seaward side of Marine Parade opposite the Pacific apartments at 10 Marine Parade. All courses begin by running/walking East along Marine Parade until reaching their respective turnaround points. Once competitors have turned at their respective turnaround points they will run/walk back through the start area then turn left onto Adams Ave and be directed around Mauao Base Track (clockwise). The Half Marathon course completes two full laps. Will there be self-seeding at the race starts? Yes. PLEASE allow the quick ones to move to the front to get away easily come race start and please place yourself towards the back if you know you are going to head off slowly. If we can all do this it will be one smooth race start! Where does the race finish? 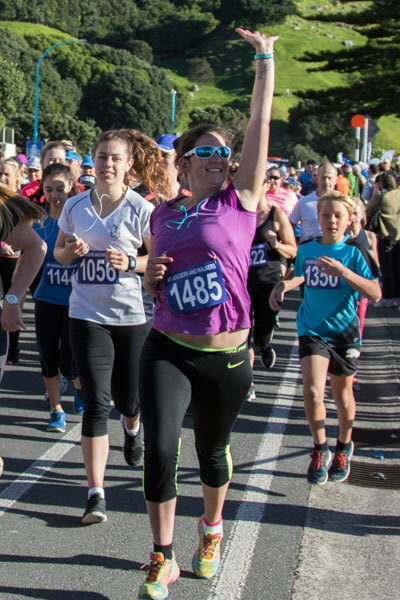 The finish line for all events is on the grass reserve approximately 100m up from the Mount Maunganui Surf Club. Will the event be timed? Yes, full transponder timing for all events except the KidsK. Can I take listen to music on the event course? Strongly not recommended. You need to be highly alert to our event marshals' instructions, to other participants and traffic. You’re running around beautiful Mauao – please give the music a rest for an hour or so! Can I push a buggy/stroller on the event course? Strongly not recommended and you will not have an enjoyable day due to narrowness of the track. Organisers request that any buggies commence the start behind the walk field and stay left and single file throughout the event. Is the course wheelchair friendly? Usually our course is wheelchair friendly but due to a slip on the base track of the Mount there are two sections of stairs which are not navigable by wheelchair. We hope the base track will be repaired by June 2019 and the course will be wheelchair friendly again. Where will the support stations be placed and what is at the support stations? Water and R-Line electrolyte drink will be available at the support stations. Where are the toilets on the course? There are multiple public toilet blocks on or just off the event course. Which side of the road do we run/walk on? Seaward side. Please STAY LEFT at all times on the event course. PLEASE NOTE: The event will have ONE LANE closure in place for the event on the seaward side – NOT A FULL ROAD CLOSURE. While this event will have the seaward lane closed to normal vehicle movements you are still to expect vehicle traffic on the course and are responsible for your own actions whilst out on the course. DO NOT EXPECT VEHICLES, PEDESTRIANS OR ANYBODY ELSE TO GIVE WAY TO YOU REGARDLESS OF THE LANE CLOSURES IN PLACE. Which direction around the Mt base do all courses go? Clockwise from the Pilot Bay side to Surf Club side. What is the course cut-off time for all events? The cut-off time for all events is midday. In accordance with Council requirements and our Traffic Management Plan all the roads are to be fully reopened to vehicle traffic at midday. Approaching midday, any entrants still on the roadway section of the course, may need to shift from the roadway to the footpath. In situations where moving to the footpath is not possible, and/or where entrants are well behind the course cut-off pace, entrants may need to be transported further ahead up the course by our event crew so that 100% of our entrants are on the base track by midday heading for the finish line. Please be aware that our tail-end Charlies and/or event staff will communicate any key messages/directions to you on the day should this cut-off time affect you. Where do I park on race morning? Please carpool with other competitors wherever you can and while there is plenty of parking on surrounding streets please factor in a 5-10 minute walk to the event base. PLEASE NOTE: Prior to the event starting, the seaward side of Marine Parade, Adams Ave and The Mall will all be closed to all vehicle traffic so please follow all traffic management signage and detours. How can I change my event option or entry details? If you would like to change up (e.g. 10km to half marathon) you’ll need to pay the $10.00 difference at pre race registration. After Thursday 31 May at 5.30pm any changes made to individual entries will incur a $10.00 admin fee. Can friends/family collect my race number and transponder on Saturday for me? Sure can. They just need to be armed with your entry details. What do I do if I can’t make pre race registration on Saturday? Your friends/family members who are able to make pre race registration may collect your race number and transponder for you. If no-one is able to collect for you on Saturday we advise arriving early on Sunday and registering at least 30 minutes prior to your race start. When does late entry kick in and how much is it? Late entry applies from 5 pm Thursday 30 May and is $10 per person. Do you have eftpos at Event HQ for race registration, late payments and race amendments? What time should I aim to be at the event base? If you have been to pre race registration on Saturday then please arrive approximately 20 minutes before your event's start time. If you need to register on the day please be at the event base at least 30 minutes prior to your event's start time. Will there be an area to leave my gear? Yes, please see the Mount Runners and Walkers team at the marquee. We have pacers in the half marathon for sub 1:45 and 2:00 hours and in the 10 km for those runners looking to come in under 1 hour. Pacers will be identifiable at the start line with signs and be wearing PACER bibs and running with balloons. Is there pre-race strapping and physios on site? Yes, there is a physiotherapist from Foundation Clinic on site from 7am on race day for free pre-race strapping and advice. Yes, massage therapists from Foundation Clinic are available in the finish line area. $10 for 10 minutes. Cash only. How do you win a spot prize? More than 100 minor spot prizes are randomly allocated to pre registered participants and given away on the Saturday and Sunday pre race registration. A collection of major prizes will be given away at the midday prizegiving on Sunday. To be in the draw simply place the tear off section from the bottom of your race number into the prize barrel which will be situated underneath the Smiths Sports Shoes tent between 11.30am and noon on Sunday. You DO NEED to be there to win. Midday on the grass reserve at the finish line area. Will there be merit/cash prizes? Cash prizes will be awarded to the 1st, 2nd and 3rd female and male in both the Half Marathon Run and Half Marathon Walk events. The first female and male in the 10km and 5km events will also receive a cash prize. When/where can I view results? Provisional results will be made available by 5.00pm on race day and results will then be finalised by the end of the next week. Results can be viewed on our Facebook event page or the Results section of this website. There are errors with the results – who do I advise? Your query will then be forwarded onto the event timing team to look at and in 95% of cases we will have a resolution for you within 24 hours. Does everyone get a medal? Yes, everyone registered in the half marathon, 10 km and 5 km events who finishes receives a finisher medal. Children in the Kids Dash (gold coin donation on the day) receive a small treat. Website Design by Zebra Creative. Follow the event on our Facebook page!